If you are in India and have been on internet for sometime, chances are you have heard Ankit Fadia’s name – The self proclaimed guru of hacking world. He is constantly in media and has been successful in creating his name as the foremost authority in Hacking. However, Ankit also has lot of detractors, who feel, he is nothing more than a script kiddie, a hacker who works mostly on thumb rules and using readymade scripts. Looks like his detractors are going to have yet another field day – Ankit Fadia’s website Ankitfadia.in has been hacked…yet again! Ankit’s site was previously hacked in December 2009, then in January of this year, and now again for the 3rd time. To be honest, a Hacker’s own site getting hacked for 3rd time is shameful (I thought long before using this word, but had not better way of describing it). What is even worse is that Ankit had openly challenged hackers in a video (embedded below) that they should hack his website and he will offer (who ever hacks his website) a full time job. Ankit’s site was defaced in response to this challenge. 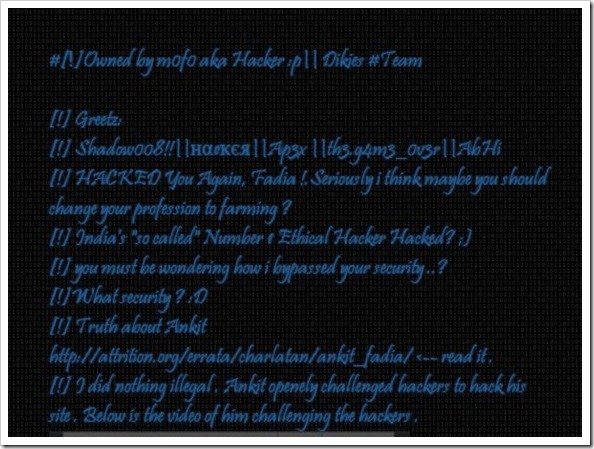 See what the hacker who defaced his website had to say (he says Ankit should probably change his profession to farming) and the video where Ankit gave a open challenge. At time of writing this, the site is already down, however, Google Cache reveals Ankit’s defaced site. [!] HACKED You Again, Fadia !.Seriously i think maybe you should change your profession to farming ? [!] you must be wondering how i bypassed your security ..? [!] Truth about Ankit http://attrition.org/errata/charlatan/ankit_fadia/ <– read it . [!] I did nothing illegal . Ankit openely challenged hackers to hack his site . Below is the video of him challenging the hackers . There are claims that the CIA consulted him to decode an encrypted messages in 2001. For some reasons, the world’s most powerful intelligence agency decided to ignore the PhD’s who spent years studying cryptography, an area where few people are invited for dinner and drinks, and turned to a 16 year old kid author of a largely plagiarized book. Ankit Fadia was trying to take advantage of the fact that intelligence agencies are highly secretive and rarely confirm or deny operations attributed to them. I’ve got a great idea. If you want to be famous, tell people you worked with some intelligence agency and you can’t go into details because of security reasons. I don’t see what the issue here is? Off course plagiarism is a serious offense but if you could keep that aside, I think he is an excellent businessman. He made full use of the publicity he received, made up a few stories around it and is now running a successful firm. There are millions of Indian businesses that sell sub standard products, lie to customers (see TV advertisements) and get away with it. Its up to the customer to understand what he is offering before lapping it up. I have a Msc in Network security, I and people in the field always knew he does not have the technical skills and his book Guide to ethical hacking is junk but I still admire him for what he has made out of his limited skills. I think he is a genius! What are examples of experts who, in the end, are really not experts? have a look at this, a little more about Fadia chap http://securityerrata.org/errata/charlatan/ankit_fadia/.